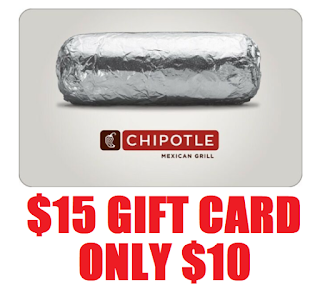 $15 Chipotle Gift Card Only $10 + Instant E-Mail Delivery. $15 Chipotle Gift Card Only $10 + Instant E-Mail Delivery. If you are going to eat there anyways then this is a free $5 for you. Just buy it and use it at your next visit and you saved yourself $5 on the way!